Not only that, regardless of whichever gaming platform you decide to pledge your allegiance to, all three of them will come with the relatively affordable price point of $39.95, now this is certainly pretty hard to argue against, really. Expect all of them to sport a comfortable design as it tips the scales at a mere seven ounces, making them extremely lightweight and comfortable to wear even for marathon gaming sessions that can stretch into the wee hours of the morning, and well into the next day. Not only that, large, full-range 40mm Neodymium speaker drivers are more than capable of delivering sizzling highs and thunderous lows, as the synthetic leather-wrapped ear-cups will work together to provide improved bass response and noise isolation. The in-line controls that are located conveniently at your fingertips will let you manipulate Mic Mute and Master Volume in a snap, while an adjustable, high-sensitivity boom mic picks-up your voice loud and clear for in-game and online chat, with the option of having it removed if you decide to take a chill pill and relax to some music or simply to watch some movies. 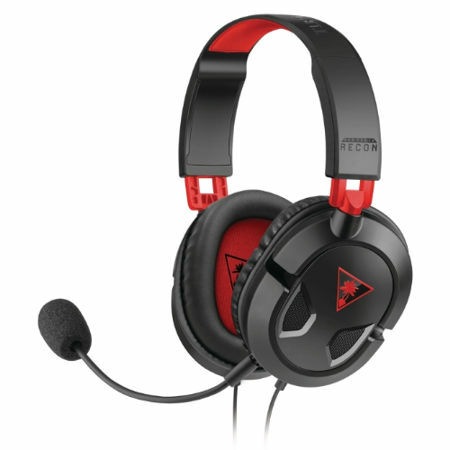 Expect the Recon 50 series gaming headsets to play nice with just about any device with a standard 3.5mm jack. Any gamers who are interested so far?